There may be bargains galore, but there are not-so-obvious ways the kickoff to holiday shopping may cost you. BOSTON (MainStreet) -- Everybody loves a bargain, and the chance to kick off the holiday shopping season with savings has made Black Friday one of the busiest days of the year for retailers. According to a Black Friday shopping survey conducted for the National Retail Federation, up to 152 million people plan to shop Black Friday weekend, up from the 138 million people who planned to do so last year. According to the survey, 74 million people say they will definitely hit the stores and another 77 million are waiting to see if the early bird bargains are worth braving the cold and the crowds. There is a lot of money out there being spent and reaped, and it all may seem win-win: Shoppers get great deals and retailers expedite their end-of-year sales. It isn't so clear-cut, however, and there are ways the blitzkrieg of Black Friday can cost all involved, eroding savings and profits alike. Every Black Friday we hear tales of violence, injury and mayhem. Among the more infamous cases was in 2008, when a Long Island Wal-Mart employee was trampled to death when its doors opened for the rush of early morning shoppers. 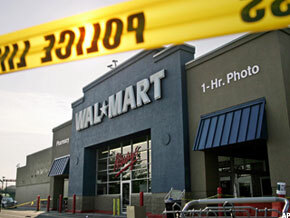 That incident cost Wal-Mart nearly $2 million in fines and mandated training. Nassau County Police examine the front of the Wal-Mart in Valley Stream, N.Y., on Nov. 28, 2008, where a temporary Wal-Mart worker died after a throng of unruly shoppers broke down the doors and trampled him moments after the Long Island store opened for day-after-Thanksgiving bargain hunting. Professor Sharron Lennon of the University of Delaware, who has studied the social psychology of Black Friday, sees the herd mentality as a result of over-reaching expectations. "People put a lot of effort into obtaining a promotion and then don't get the promotion, which happens a lot on Black Friday," she said of her 2010 research into the mob mentality into the mob mentality. "Then they get angry about it. People are putting in all this effort getting up early, cutting out coupons ... then they get there and they find out the goods are gone because they are out of stock or because there were not very many to begin. They are going to be angry, and some of them might be the ones who engage in the consumer misbehavior." Her suggestions for curbing Black Friday violence include "anything that moves the shoppers in and out and reduces the effort they have to spend." She has advocated distributing vouchers for big sale items and "announcing unexpected bargains" similar to K-Mart's blue-light specials. According to the U.S. Department of Transportation, the 24 hours of Thanksgiving Day can also be deadly for those behind the wheel. In 2007 there were 553 traffic fatalities, 507 in 2008 and 411 in 2009. Though not necessarily shopping related -- aside from those who couldn't bear the lines at Wal-Mart ( WMT - Get Report) sober -- the percentage of alcohol-related fatalities was remarkably consistent. There were 196 such accidents in 2007, 35% of all fatalities, 180 (or 35%) in 2008 and 139 (0r 34%) in 2009, the most recent year for which data were available. As far as Black Friday itself, there were 89 traffic fatalities in 2009, 101 in 2008 and 137 in 2007, according to statistics provided to TheStreet. To get the best deals, there are plenty of folks who will stay up all night, stumble out of bed in the middle of the night and even camp outside for days. We tend not to think about shopping in these terms, but your time is valuable. Think in terms of what you might be paid at work, or for a vacation day, and the savings you earn may not seem in line with the wasted leisure time. A survey by Consumer Reports gauged how much time people spent on holiday activities. According to its annual Holiday Shopping Poll, shoppers expect to spend 19 hours hunting down gifts this year, an increase of four hours over last year (a third say, however, that they expect to spend less money, meaning that extra time will be spent chasing bargains). One in four Americans plan to hit the stores on Black Friday. Shoppers said they expect to spend 8.5 hours traveling, three hours waiting in line and three hours wrapping gifts. What does all that mean in terms of personal cost? We may not have a breakdown of how many of those hours will be a direct result of Black Friday shopping, but there is no denying that the time spent browsing aisles and waiting in line does adds up monetarily. According to the U.S. Labor department, the mean annual wage in America divides into about $20.90 an hour. Following Consumer Reports' estimated time spent and shopping, that comes out to about $439 in what you might have commanded by working -- a simple though admittedly unscientific metric of what your time is worth (it would account for even more if you were to factor in time-and-a-half holiday and overtime pay). The personal expenses add up as you consider how much gas is expended driving around from store to store, stuck in traffic and idling while waiting for a parking space to reveal itself. Get into a fender-bender and you may be in for an insurance surcharge and perhaps even a hospital co-pay. Taxes? It proved difficult to get a granular breakdown of how much cities and towns pay for police and fire personnel above and beyond Black Friday details -- a statistic that varies across departments. But in most communities, their ranks are out in full force that day, often doubling the number of feet on the ground compared with a typical day. The same goes for ambulance companies often responding to a steady stream of shopping-related calls ranging from dizziness, heart attacks and the occasional impact of violent shoppers and accidents. If you are willing to sacrifice your own time, be aware that you are also taking responsibility for thousands of retail employees being forced to forgo their holiday in preparation for the next day's sales. Increasingly, they have to work the holiday itself. In Monday, bags filled with petitions signed by 190,000 people were delivered to Target's ( TGT - Get Report) Minneapolis headquarters to protest employees being called into work at 11 p.m on Thanksgiving Day to get ready for a midnight opening. With all that spending, consumers are bound to fall for a raw deal or two. It isn't that they are duped, necessarily, rather that they so adrenaline-rushed that they don't consider the true value of what they are buying. Is that cheap HDTV a good buy even at that reduced price? How good, and for how long, is the warranty that comes with it? Are you on the hook for buying other accessories and cables? And that video game console may fit your budget, but the high-priced games may push your spending into the red. The hectic pace of Black Friday will lead many to whip out a credit card, swipe now and worry later. "On Black Friday, people will be ringing up massive credit card debts on multiple cards. In fact, the average person carries around $4,000 in credit card debt and layers in another $1,000 to $1,500 around the holidays," says Rod Ebrahimi, CEO of ReadyforZero, a free online platform that lets consumers to pay down their credit card debt, student loans, mortgages and car payments through a single site. "The problem is, most of these people don't know how to manage their debt and pay it down expeditiously after the shopping spree is over." His advice is that no matter how great the deal may seem for that new gadget or toy, "buying it will not save you money unless it's something you absolutely need." He compares taking a credit card into a store on Black Friday to "taking a piece of prime rib into the tiger cage at your local zoo." "With a credit card in your pocket, you might end up talking yourself into all kinds of purchases," he says. "Retail store managers are smart. They've developed highly refined ways of getting you to spend money. One of these ways is by getting you into the store with a few low-priced items -- on which the company takes a loss -- and then leading you toward other purchases." "Clearly, retailers do well during the holidays, but they aren't the only ones shouting from the rooftops. Financial institutions benefit from Black Friday as well," says Dan O'Malley, CEO and co-founder of PerkStreet, a Boston-based financial firm that offers a rewards debit card and checking accounts and is partnered with Bancorp Bank in Delaware. In a recent survey, 76% of customers polled by PerkStreet said they were going to stay away from the stores on Black Friday "because the value just isn't real." Just 21% said they will be shopping Black Friday deals for things they already plan to buy. None of those polled said they think Black Friday provides "great value." Last Black Friday, O'Malley said, his customers spent, on average, about 50% more than they would on a normal day. "Black Friday is the pinnacle event for shopaholics and debt-spenders," he says. "The truth is, many people in this country are addicted to spending money they don't have in an effort to get great deals, and that contributes in a major way to consumer debt. What's worse, many customers who've been spending responsibly will buck their regular responsible spending for an easy win on Friday, effectively vaulting themselves into debt. If credit card issuers have a favorite day of the year, it's definitely Black Friday. That's the day that new debt habits are formed." "Somehow we've acculturated to this idea that spending money we don't have to get in on a 'great deal' is better than spending a little more on something we've saved for," he added. "But with interest rates on many credit cards now over 20% it's easy to see that shopping for the deal with money you don't have can mean paying way more than you would have if you'd just bought it at the retail price with cash." Black Friday will surely be profitable for most retailers. But will it be as successful as they hope given the massive expenditure in personnel and security? According to Accenture ( ACN - Get Report), a global management consultant, consumers are on track to be far more savvy this year. "This holiday season will see the balance of power continue to tip in favor of the consumer," says Janet Hoffman, managing director of Accenture's retail practice. "'Precision shoppers' will dominate. They will be very targeted about where and what they buy, and will be more inclined to shop around for the best value." Accenture warns that the hassle of Black Friday may have reached a breaking point that makes it less important to buyers. "A larger proportion of shoppers will be leaving their holiday shopping until after Black Friday compared to last year and one-third will leave the bulk of their purchases until December," Accenture predicted in a study. "The expectation of better discounts being available is the lure for 57% of consumers shopping late in the season, while 35% say they are leaving themselves more time to save." Increasingly shoppers are shifting their attention online, away from bricks-and-mortar stores. "I think the savvy online shoppers have known probably for about three years that there is no reason they have to go tough it out at 4 a.m. on Black Friday outside the local Target," says Fiona Dias, chief strategy officer for ShopRunner, a membership club offering free shipping and other perks in conjunction with many top retailers. "All those retailers have been offering black Friday specials on their Web site, often starting Wednesday at midnight, but typically throughout the day on Thursday as well for people who want to take a break from eating turkey and watching football. More and more people are starting to figure that out that unless you like to stand outside in the cold, there is really no reason you have to. You literally get the same deals."